The Clotheshorse has moved and changed it’s name! Your go-to source for the fashionable equestrian is now called Bridles and Baubles and can be find at BridlesandBaubles.com. Please check out the new site! Been taking a break from blogging but pinning like crazy on Pinterest. To keep up with my fave fashions, products, recipes and home decor follow me on Pinterest: http://pinterest.com/clotheshorseok/. I am a beauty junkie and with that comes a love for beauty product samples. There is something about the small packaging and the promise that this product may just be the best you have ever tried and if it isn’t you aren’t out the money of buying and trying full-size products. My friend and fellow blogger Allyson In Wonderland introduced me to an amazing new beauty website called Birchbox on her blog. I was intrigued by a company that offers you a monthly subscription that happily deposits a box full of beauty samples into your mailbox. It’s pretty simple, for $10 a month you receive deluxe beauty samples that allow you to try top beauty products and if you like the samples you can order the real deal on their website (plus they usually give you a discount if you buy the full-size of one of the samples they sent you). It’s a brilliant concept and well worth subscribing to; I got my first box last week and it was full of great samples that I immediately put to the test; now if only I had thought of it! PS I was in no way compensated for this post. It’s just a product I love and wanted to share with you all! I first learned how to apply eyeliner when I was 15 at the Bobbi Brown counter in Neiman Marcus. We were in Ft Worth at the American Paint Horse Association World Show and were doing a little shopping in our down time between showing and riding. It was the first time I had ever had my makeup done by a professional and it was then and there I became a life-long devotee of Bobbi Brown cosmetics. At the time the makeup artist used black eyeshadow and an eyeliner brush to rim my eyes, instantly making them pop and transforming me into a glamourous woman. For years I have tried different types and brands of eyeliner but always went back to my trusty powder eyeliner applied with the eyeliner brush I bought so many years ago at Neiman Marcus in Ft Worth. The only problem with powder shadow is that it does not always last a full day without re-application so I decided to try the much lauded Long-Wear Gel Eyeliner by Bobbi Brown. Let me tell you, it is AMAZING! This gel formula goes on so smooth and easy and once it sets, it stays on. My black cat eyes lasted thru a full day in the barn (riding and working horses, bathing horses, cleaning the barn) as well as dinner and drinks with my husband that evening. Use the Ultra Fine Eyeliner Brush to apply it and off you go with perfectly rimmed eyes. The weekend is fast approaching and it’s time to get your friends together and hang out in your backyard or by the pool. I have the perfect summer drink to make for all your pals or if you prefer to drink alone this pitcher will last you all weekend. Cheers! Pour wine into large pitcher and squeeze the juices from the wedges and toss them into the wine. Add pineapple, sugar, lemonade and gin. Chill overnight. Add gingerale, berries and ice just before serving. You can skip the gingerale, if you wanted it to be richer and less fizzy. If your summer involves spending a fair amount of time in a pool that uses chlorine, your skin can come out very parched and this great tip helps re-moisturize your skin. Salt is a potent hydrator that can help deliver moisture to your skin cells. So if you’re dried out after a day of swimming, soak for 10 minutes in a bathtub of water and 1 cup table salt. Rinse briefly, pat yourself dry, then seal in the remaining moisture with lotion while your skin is still damp. I must confess that as a happily married woman, I have a boyfriend. Actually, I keep two boyfriends in regular rotation. I find that having two boyfriends keeps things new and interesting. One is casual and easy-going and the other appeals to my dressier side. AG Jeans and Paige Denim make the best boyfriends; boyfriend jeans that is. What were you thinking? I don’t have two boyfriends just two awesome pairs of boyfriend jeans. I recently acquired the AG Cuffed Tomboy jean and instantly put it into full-time rotation in my closet. It sits loose on the hips without being low-rise and is cut slouchy through the thighs with a straight, cuffed leg that looks classic yet relaxed. They look great with tees and tanks on top and pair nicely with flip flops, flat sandals and Superga sneakers. Available at Anthropologie. The Jimmy Jimmy Skinny from Paige Denim was my first pair of rolled boyfriend jeans and to this day remain one of my faves. They are made out of super-soft denim that is slouchy yet slim and can be dressed up or down. Available at Paige Denim. Protect your skin from the sun with La Roche Posay Anthelios SX Daily Moisturizer with SPF 15, it’s the best hands down! Absorbs quickly, non-greasy and loaded with lots of science that protects your skin. Thick liquid and powder foundations can goop and smear when the temperature rises, so I rely on Laura Mercier’s Tinted Moisturizer with SPF 20. It provides just enough sheer coverage without being thick or heavy and makes your skin look luminous. I have very fair skin and refuse to tan naturally so I spend a fair amount of time and money using self-tanners and have tried them all. St Tropez Self Tan Bronzing Mousse is the best! Provides even, natural-looking color with no self-tanner smell. 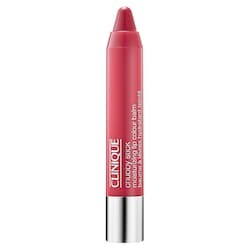 I know I have blogged about the Clinique Chubby Stick Moisturizing Lip Color Balm before, but they are really so good that I must mention them again. Grab a few and keep one stashed in your car, purse, beach bag, desk drawer and the barn (for my fellow equestrians). They provide light-weight, moisturizing color perfect for summer days. Benefit’s They’re Real! Mascara is my new favorite mascara. 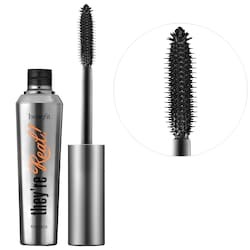 This long-wearing (ie won’t smudge or melt in the heat), glossy formula reveals lashes you never knew you had.